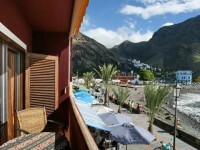 The Gomera Lounge in Valle Gran Rey on La Gomera is situated directly on La Playa’s beach promenade. In the former Casa Rudolfo, the Gomera Lounge offers attractive apartments with great views, a nice lounge as well as a whirlpool and sauna, all under one roof. The former Casa Rudolfo has been completely restored and is now the Gomera Lounge complete with its unique flair and lots of extras. In the Gomera Lounge, guests can enjoy the direct proximity to the beach and the calming sounds of the ocean. The blue Atlantic invites guests for a swim, directly in front of the Gomera Lounge. Across the car free beach promenade in La Playa, the main beach, Playa de Valle Gran Rey, is only a few metres away. The dune beach Playa del Ingles is only a five minute walk away. The cafés, restaurants and charming small shops in La Playa all contribute to the wonderfully relaxed atmosphere that surrounds the Gomera Lounge. In the Gomera Lounge Apartments in Valle Gran Rey, guests can enjoy a magnificent sea view, wonderful atmosphere and the direct proximity to La Playa’s beaches. The Gomera Lounge’s very tasteful beauty shop on La Playa’s beach promenade offers a large selection of natural cosmetic products as well as decorative cosmetics and pure aloe vera products from the Canary Isles. Your request or reservation will be sent directly to Gomera Lounge. All prices are valid for an occupancy of up to 2 persons.